You may be looking to get a real estate license because you want to make a little extra money on the side. You may be looking for a complete career change and real estate excites you. Or you might simply be looking to get a real estate license because you’re about to buy or sell your own home and you want to keep the 3 – 6% commissions for yourself. There are many reasons for getting a realtor license and almost all of them are good ones. With how relatively inexpensive it is to get licensed, it’s almost always worth it. What’s required to get a real estate license? 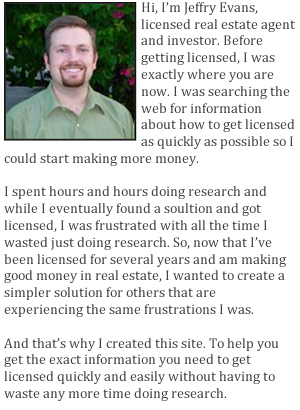 In the United States, if you want to make money in real estate, you have to get licensed. Each state has specific requirements for getting your real estate license. Aside from basic age requirements, each state generally requires that you complete a certain amount of training or “classroom hours” prior to taking your exam and getting your realtor license. For example, Michigan requires the least amount of pre-license classroom hours with 40 while Texas requires the most at 180. Other states will vary in hours somewhere in between these two. Keep in mind that while you do have to complete these “classroom hours” to get your real estate license, you don’t actually have to attend a school or even have to leave your house for that matter. Most states will allow you to take home study courses that you can complete in your free time and at a pace that works best for you and your current schedule. But, please be aware, not all courses are created equal. You can’t just go out and purchase a “one size fits all” course and hope that your state will approve it. You have to get one that is pre-approved by your state and meets all of your state’s specific requirements. Even still, there are a lot of courses that may be pre-approved by your state, but still fall short in effectiveness of training. Remember, even though you may complete your pre-license training hours, that doesn’t mean that you’ll pass the state’s final licensing exam. So, take the time and spend the money to get a good training course. And better yet, get one that guarantees that after you complete you’re training, that you’ll pass your test the first time. Good training courses usually run any where from $100 – $500 and they are priced according to your state’s requirements. Meaning, if your state only requires 45 hours of training, a good course will be around $100 – $200. If your state requires 150 hours, expect to pay closer to $400 – $500 simply because those courses will be longer and require the course creator to provide more training material. What are your specific state’s requirements? I’ve already done the research for you and compiled a complete document on what your specific state’s requirements are for getting your real estate license. Select your state below, click the “Go” button and I’ll show you everything that your state requires to get licensed. Plus you’ll have access to some great real estate success quick tips to help you get started on the right path.